You can print photos on a variety of paper types and sizes. You can load photo paper in these sizes: 4 × 6 inches (102 × 152 mm), 5 × 7 inches (127 × 178 mm), 8 × 10 inches (203 × 254 mm), A4 (8.3 × 11.7 inches [210 × 297 mm]), or Letter (8.5 × 11 inches [216 × 279 mm]). Close the paper stopper and output tray, if necessary. Pull out the paper cassette. Slide the edge guide to your paper size. 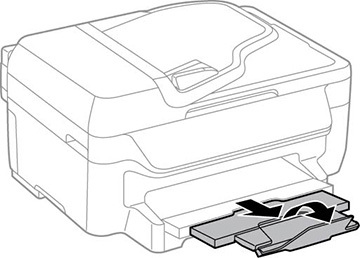 Load photo paper, short edge first and printable side down, against the edge guide as shown. Note: Make sure the paper is loaded against the edge guide and not sticking out from the end of the cassette. Slide the edge guides against the paper, but not too tightly. 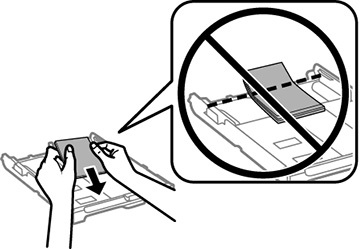 To prevent paper feeding problems, make sure the paper fits beneath the top edges of the guides and do not load too much paper in the cassette. Note: The paper may slide forward slightly as you insert the cassette. This is normal. When prompted by the product's LCD screen, select the size and type of the paper you just loaded and press the OK button. 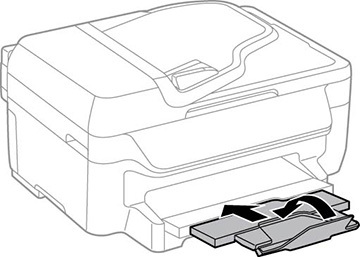 Extend the output tray and open the paper stopper. Note: If you are using legal-size or longer paper, do not open the paper stopper. 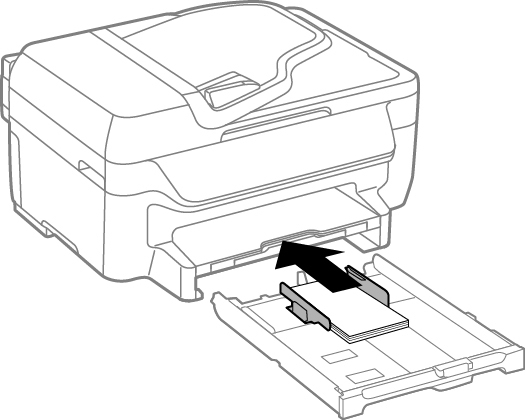 Do not remove or insert the paper cassette during printing. Load paper short edge first, no matter which way your photo faces. 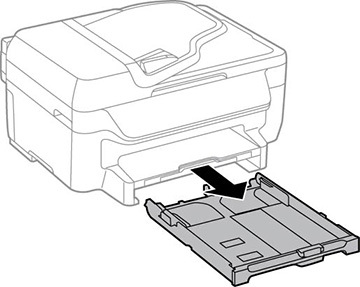 Load the printable side facedown. 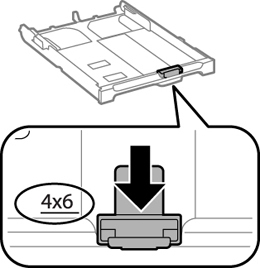 Do not load paper above the arrow mark inside the edge guide.